In Europe, there are Clinical Practice Guidelines, which typically use a classification system with three or five mobility levels. 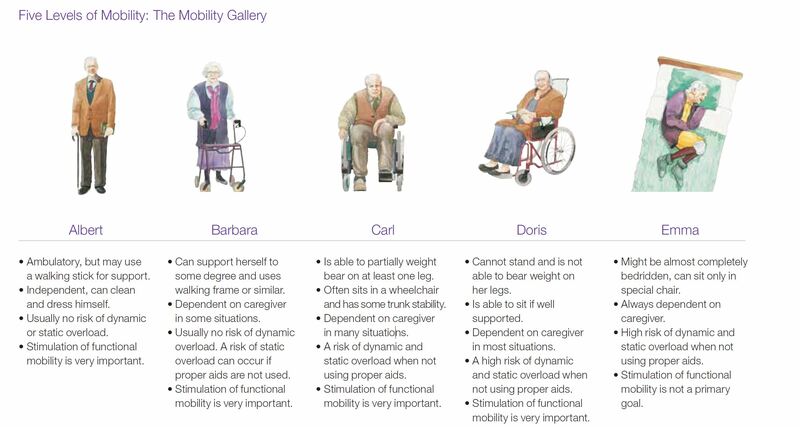 At Arjo, we have worked with safe patient handling experts to develop the Mobility Gallery™ which classifies patients and residents into five functional mobility levels of A, B, C, D, E or Albert, Barbara, Carl, Doris and Emma. Click here to see how the Mobility Gallery can aid development of a higher standard of care, stemming from insights into - and monitoring of - the requirements and preconditions for this type of care, as well as for the wellbeing of caregivers.